These two fun and feathery winter warmers make great last-minute gifts. Stitch the earmuffs with a simple, unadorned headpiece, or add a further splash of style with a crochet-covered headpiece. 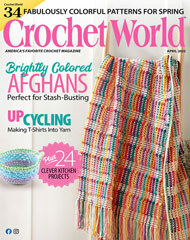 This e-pattern was originally published in the December 2010 issue of Crochet World magazine. Size: One size fits most. Made with fine (sport) weight yarn, bulky (chunky) novelty eyelash yarn and size L (8mm) hook.